(a) Only God can create, that is, make something from nothing, because creation requires infinite power, which God alone possesses. (b) All things except God depend on a cause for their existence and hence must have been created by God. (c) God did not have to create the world; He did so freely. (d) God preserves all creatures; otherwise, they would at once return to nothingness. He also governs all things, and in the divine government of the world nothing does or can happen unless God wills or permits it. (e) Evil is the lack of some perfection. God does not will physical evil in itself but only insofar as it is connected with some good. (f) God wills or permits the physical evils of life in order to punish sin, to make sinners repent, to try the just and make them worthy of everlasting reward, or to be the occasion of some other greater good. (g) God permits but does not will moral evils. (a) It is a matter of faith that God the Creator produced out of nothing creatures both spiritual and corporal, angelic and earthly. (a) Reason alone cannot prove that the angels exist. Reason indicates, however, that just as there are purely material creatures, and creatures composed of both matter and spirit, so also it is fitting that there should be purely spiritual creatures. (b) Angels are spiritual beings inferior to God and superior to man. (c) Sacred Scripture frequently speaks of the angels and mentions three by name: the Archangels Michael, Gabriel, and Raphael. (d) The nine "choirs" of angels are the Seraphim, Cherubim, Thrones, Dominations, Virtues, Powers, Principalities, Archangels, and Angels. (e) The exact number of angels is unknown, but Sacred Scripture indicates that their number is very great. (a) God bestowed upon the angels supernatural grace by which they could gain eternal happiness. (b) The angels were given the opportunity to merit the reward of heaven by remaining faithful to God. (a) We do not know the exact nature of the test to which God put the angels that they might prove themselves worthy of eternal happiness. (b) The angels who were unfaithful committed a serious sin, for which they were punished. 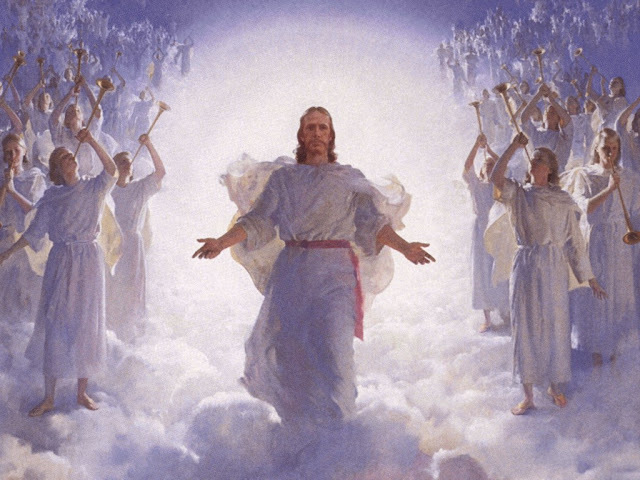 (a) The Old and the New Testament refer frequently to the work of the good angels among men. A good angel was the "rude of God's chosen people (Exodus 23:20); the protector of Tobias was a good angel (Tobias 5 ff.). 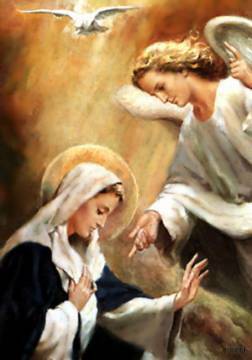 The Archangel Gabriel announced the glad tidings of the Incarnation to Our Blessed Mother (Luke 1:28). (b) Although angels are pure spirits, they can be seen by man when on special occasions God permits them to take on bodies or the appearance of bodies, which are visible to the human eye. (a) It is a matter of faith that angels are deputed as the guardians of men. (b) It is commonly held that each individual has a special guardian angel. (a) The devils, or the evil spirits, were created by God, not as bad beings but as good beings. By their own free acts, they chose evil and thereby became bad angels. (a) Devils are sometimes permitted to enter the body of a man and to exercise power over his faculties—a state known as diabolical possession; or the,, are permitted to torment a person from without—a state known as diabolical obsession. (b) Diabolic possession and obsession are permitted by God to show forth His glory, to punish sin, to bring sinners to repentance, or to give occasion for the exercise of virtue. (c) When the devil uses the body of a possessed person to say or do evil things, the person is not guilty of sin, provided he does not freely consent. (d) Exorcism is the act of driving out or warding off evil spirits from persons, places, or things possessed or infested by them. The Church received from Christ the power of exorcism. (e) An exorcist is one who has power, conferred by a bishop, to exorcise demons. The order of exorcist is the third of the four minor orders of the Western Church. Only with the permission of his bishop is a priest allowed to use his power of exorcising evil spirits. (a} The bad angels, the persons and things about us, and we ourselves can excite the senses and be an inducement to sin. (a) God does not demand the impossible; however He warns us that in our efforts to overcome temptation we must not rely entirely on ourselves but must seek His help. (b) God permits us to be tempted in order to make us realize our weakness, to test our faith, and to help us by His grace to strengthen virtue by practice and to obtain the reward of eternal life. (c) The most effective means of overcoming temptation are prayer, mortification, frequent Confession and Holy Communion, and avoiding idleness and the near occasion of sin.